Labor Day is coming up next week. Hooray for a holiday! 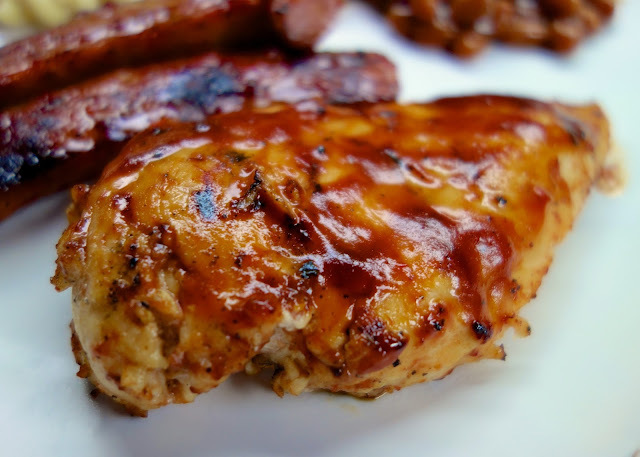 This BBQ chicken is perfect for your holiday cookout. It was good and tangy! The original recipe was intended to be a mop sauce for smoking chickens. We don't have a fancy smoker (yet), so I decided to marinate some chicken and smoked sausage overnight in the mixture. I had some concerns because the marinade had so much apple cider vinegar, but I couldn't taste it after the meat was cooked. I think the beer and BBQ sauce mellowed it out. 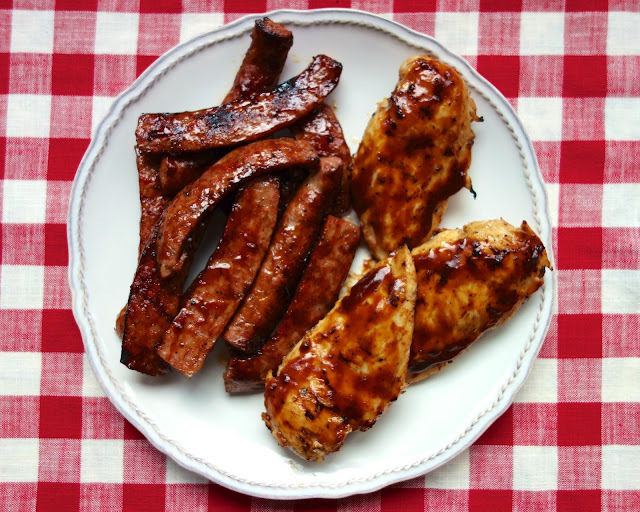 Use your favorite beer and BBQ sauce in the marinade. I used a Miller Light and KC Masterpiece Original BBQ sauce. 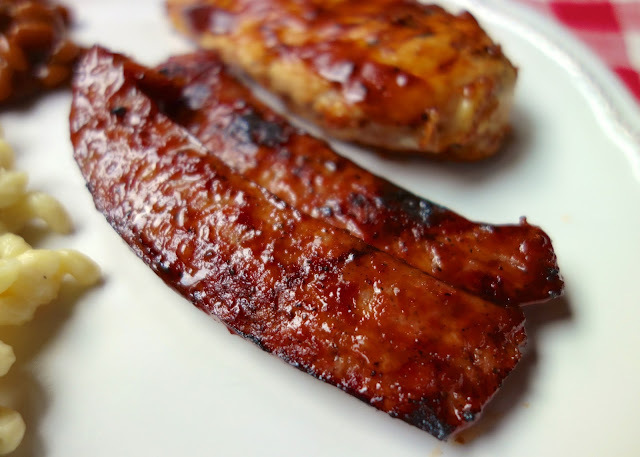 I have also made this marinade with apple juice instead of the beer. It was equally delicious! We brushed the chicken and sausage with some additional BBQ sauce to finish it off. This was out-of-this-world delicious! We are making this again for Labor Day. This was some of the best BBQ chicken we've ever had (if not the best). Whisk together apple cider vinegar, beer or apple juice, BBQ sauce, salt, pepper and hot sauce. Pour marinade over meat and marinate overnight. Grill meat until done. Brush with additional BBQ sauce before serving. This looks yummy! 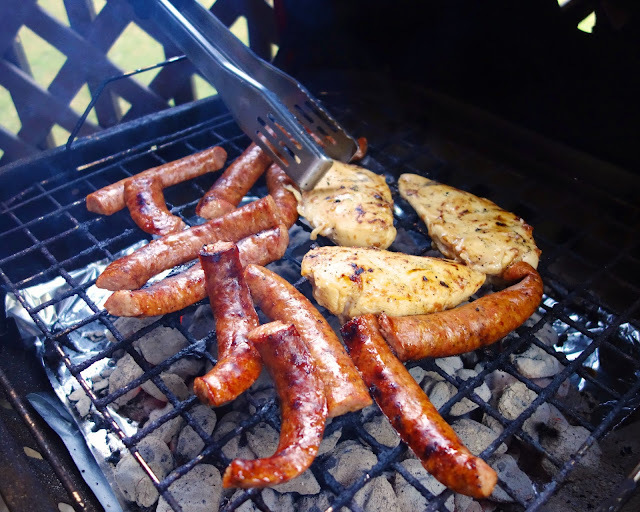 I dont do the grill but I willbe putting my boyfriend to work and trying this! Love this! Pinning! I'm always looking for new BBQ chicken recipes for the grill. This looks absolutely amazing! I've got some guests coming in from out of town, and looking for new things to wow their taste buds with. This will be perfect!!! Thanks again Steph for all the wonderful recipes you create. There are so many my family and I love.